Rope guys have coin chops, too! Generally, stage performers are terrible at sleight of hand. But, then again, most of us finger-flingers look like goofs trying to work a big illusion on a stage. French FISM Stage Magic Champion Francis Tabary is clearly the exception. Here he demonstrates a pretty baffling vanish, not once, but THREE times in a row! 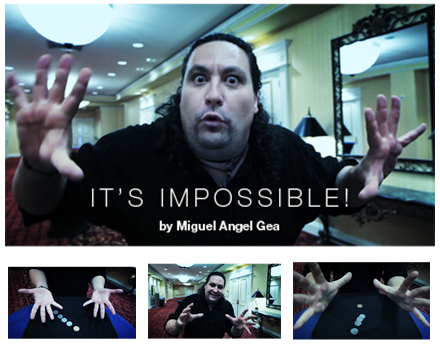 Channeling a little bit of Juan Tamariz and a little bit of Rene Levand, Spanish magician Miguel Angel Gea has created a whirlwind effect called It's Impossible! It's part Transposition, part Copper/Silver, part GadAbout Coins and all fun! Like the classic Rene Levand 'Rojas Y Negras', the presentation just gets more impossible the more times you do it. The moves are easy so you can concentrate on the presentation and the gaffs needed are probably in your pocket right now. Miguelito has a pretty strong Spanish accent but the teaching is very clear and thorough. For $5 you get some easy, astounding coin magic and you get to act a little "Tamariz-y" which is always fun. Definitely recommended! Coin Demi-God and all-around cool guy Kainoa Harbottle has released a new 1-coin "Flurry" routine called Portal and it's really wonderful. 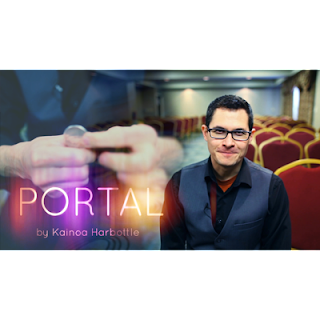 Kainoa teaches a couple of great new moves, one of which is the Portal Move. It's a beautiful way to do a repeatable vanish and production of a coin that Shoot Ogawa did with a purse frame, but without the purse frame! The coin just winks out of existence as the coin is pushed into and pulled back out of the left hand. The move is totally different from Shoot's and is really beautiful work! He also teaches his Wave Vanish. If you've seen his Penguin Magic lecture video (shame on you if you haven't!) then you've learned this move as part of his version of Geoff Latta's Quadra-Quick Coins Away. This is his attempt to compete with the 'YouTube' kind of magic (heavily-edited or only possible on a video), and the result is a casual wave and the coin is gone. Kainoa also goes into great depth on the Drop Retention Vanish. A move that is easy to do, and easy to do poorly. His tips really help to make this move as amazing as it should be. Kainoa then breaks down the entire routine step by step and explains a wonderful ending where the coin vanishes from one outstretched hand and VISIBLY appears in the other hand. You end with arms wide open in a perfect applause cue! The teaching is, of course, wonderful. And the material is real-world, worker, use-it-every-day magic. The price is a pittance for all the great magic you get! Highly recommended! Available as an Instant Download for $7.99 from Penguin Magic! Tell 'em Ben sent ya!